Yet another Saturday, I was just flipping the newspaper when something caught my attention, it was an article in HT mentioning the very old but famous eating joints in old Delhi. And before it was too late I already knew how to spend my rest of the Day!! 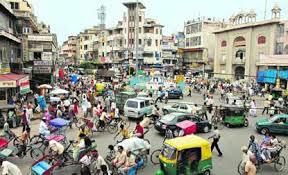 I chosen to reach Chandni Chowk thru easiest and best mode of transport and taken metro from Saket station, as soon as you reached this place you felt like “oh man where we have landed” full of chaos, crowd, dirt… but actually this place is a mixture of religion, food, traditions and history. Every shop here has some history associated with it and ran by generations of the same family. So many narrow lanes with shops offered vivid verities of clothes, electronic, wedding materials, jewelry, artifacts, electronics, and whatnot. 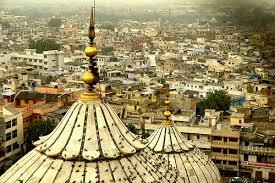 You can find an amalgamation of the different religious shrine like Jama Masjid, Sri Digambar Jain Lal Mandir, Hindu’s shiv temple, Central Baptist Church, Shish Ganj Sahib Gurudwara, Fatehpuri Masjid as if all these has something to offer to his visitors which bring harmony to this place. Walking thru the narrow lanes I first decided to take a look to very old famous Shish Ganj Sahib. 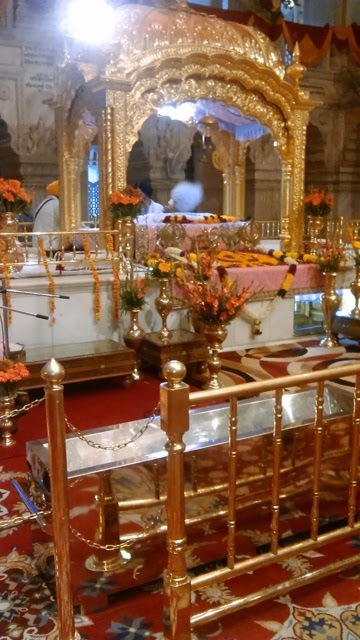 The Present Gurudwara Structure was built in 1930,Sikh’s Ninth Guru “Guru Tegh Bahadur” was beheaded on the orders of Mughal emperor for refusing to convert to Islam.The trunk of a tree under which the Guru was beheaded is also preserved here. Now its time to explore some eating joints to satisfy my taste buds!!! Passing thru the narrow lanes of Paranthe wali Gali, you can find the Maliwara area where this shop has its outlet. 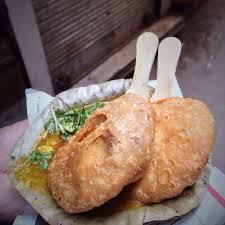 Claims to have the best kachori and aalu ki sabzi, this small stall has many other delicacies to offer too including Samosas, Jalebi, Pakoda at affordable rates. This palace is packed and crowded by food lovers.I had to literally make my way to the counter to place the order. The kachoris were very crisp and hot but with less stuffing inside, Sabji was too spicy. I found this place slightly overrated but since it is famous makes it a must visit. I took a hand pulled cycle rickshaw and head towards Lal Quan passing thru the narrow lanes of Nai sarak (book market) in search of a famous kheer shop; it took me more than 45 mins to search and reach to this shop. 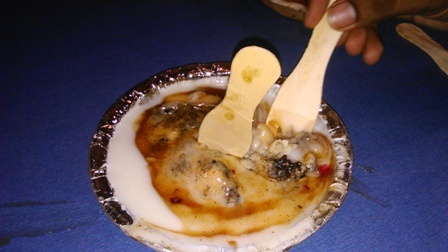 This Shop was established in 1940 and since then it is mostly famous for its mouth watering dahi bhalle. Bade was dipped in reds and green chutney, surrounded by thick and creamy curd. 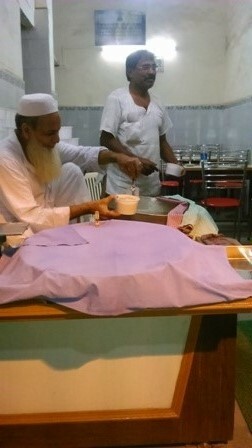 They also specialize in Aalu tikki and chat. I also placed an order of aalu tikki which too was as expected – delicious!!! 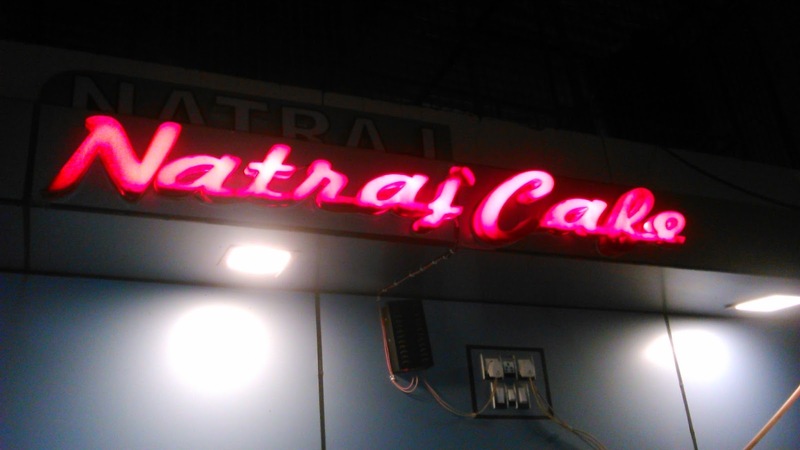 They have a separate cafe just above the shop which offered verities of foods including southindian, chole bahture and north Indian meal too. 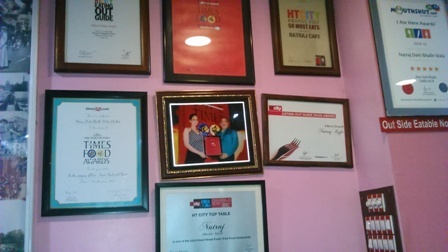 This cafe has earned impressive strings of awards to its name this place is very close to Metro station, just a 5 mins walk and situated in one of the busiest lanes. After having so much I called it a day off but still left with so much to explore and to taste, my list had missed the below mentioned and famous eating joints , but definitely due for next sometime. 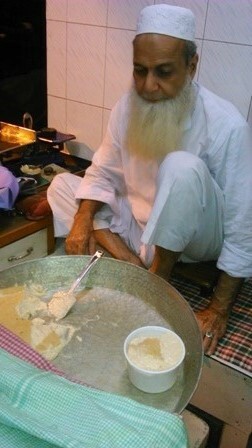 Gianji ka Falooda …whooop the list is really long!!! So much was told and said about Chandni chowk and so much left to explore but I feel that amidst of all this congestion, chaos yet this place has some mysterious aura around it, which made this place truly special and a must Visit.